Vice President Mike Pence spoke Saturday at the Values Voter Summit, hosted by the Family Research Council. (FULL Video Speech Below) The US Vice President explained that he is 1st a Christian and encouraged pro-lifers to fight back peacefully with prayer, advocacy and their votes. 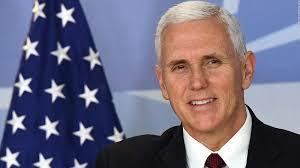 Among what he called accomplishments of the last two years, Pence credited Trump for non-enforcement of the “Johnson Amendment,” a law that prohibits tax-exempt charities like churches from endorsing political candidates, and said the White House will continue to work for its total repeal. “Finally, let’s keep faith that he who has ever watched over this nation still governs in the affairs of men and that as we hold fast to him we will run and not grow weary, we will walk and not grow faint and that he will yet bless America abundantly more than we could ask or imagine in this one nation under God, indivisible, with liberty and justice for all,” the vice president wrapped up his speech.